Hi friends! 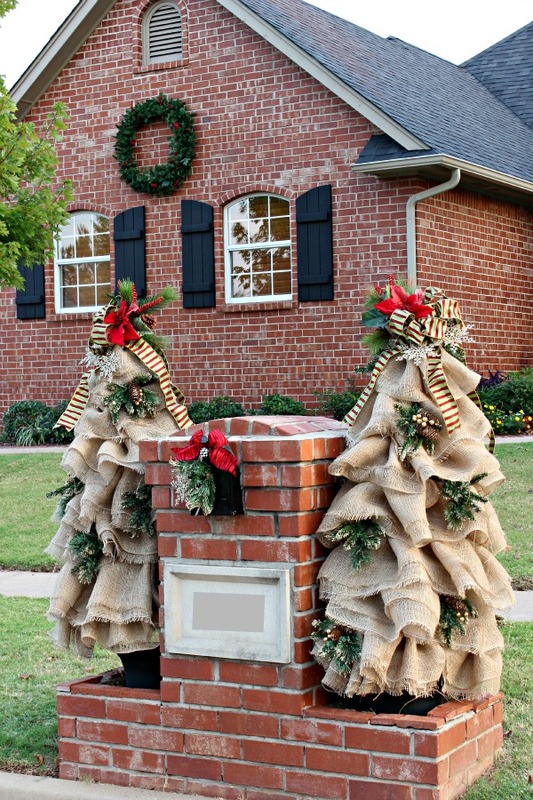 Thank you so much for all of your kind comments on my Home Depot Holiday Style Challenge project! 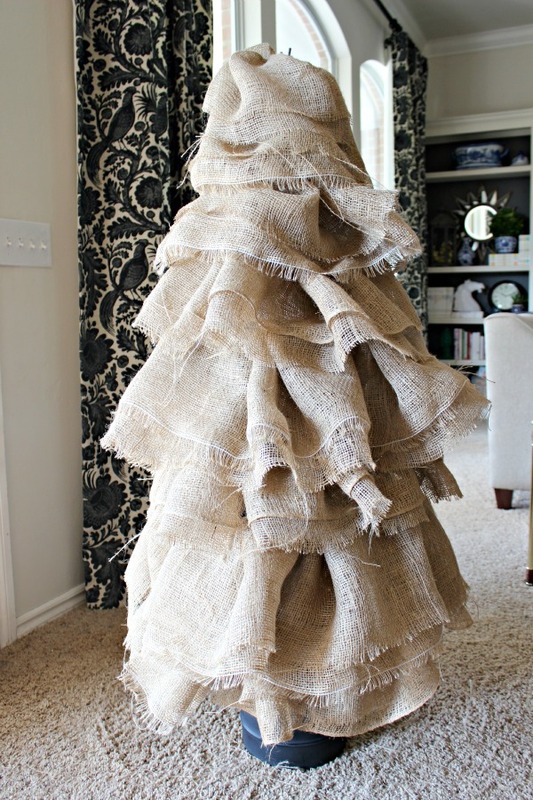 Today I want to share how I made the ruffled burlap trees. 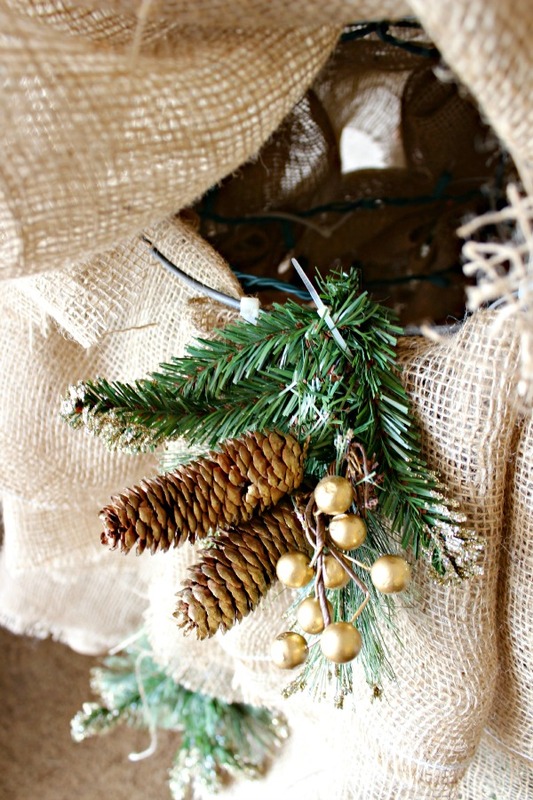 When I received a huge roll of natural burlap, a few Christmas garlands, floral picks, and ribbon in my mystery box, it took a little brainstorming to figure out how to use those supplies to decorate my mailbox. 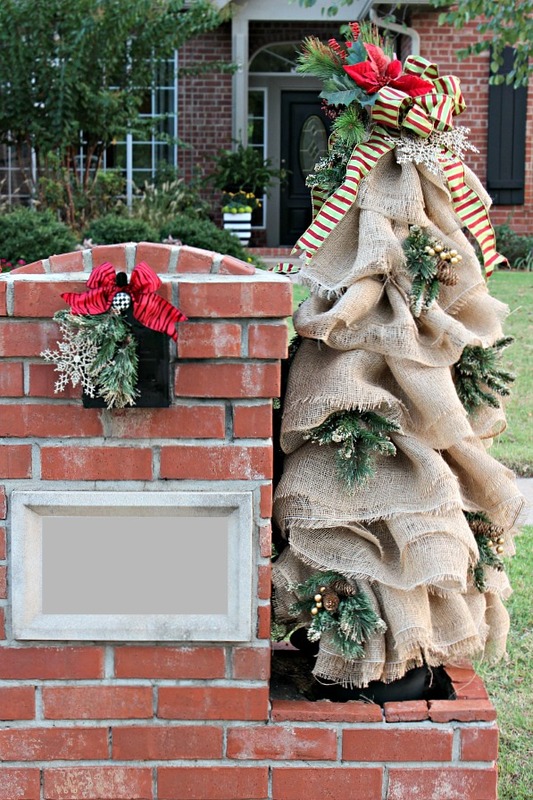 But, after a little collaborating over the phone with my smart sis, we came up with the idea to use all of the burlap to make a pair of trees to flank the mailbox. Believe it or not, 100% of the supplies I used came from The Home Depot, and it's all held together with zip ties. 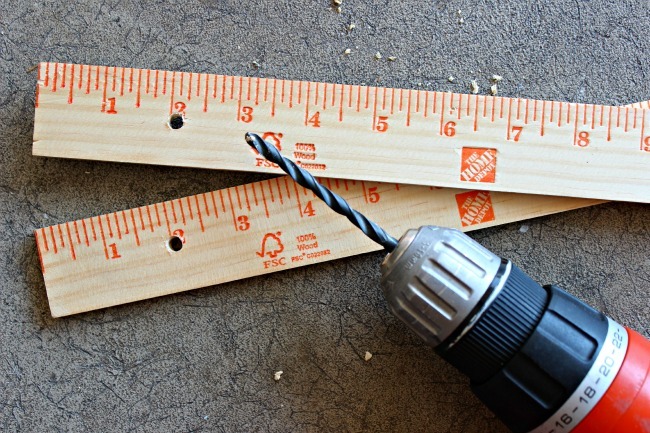 I started by drilling a hole two inches from the end of each yard stick. These will be used to support the tomato cage forms. The trees need a solid, heavy foundation to withstand any gusts of wind without getting knocked over. 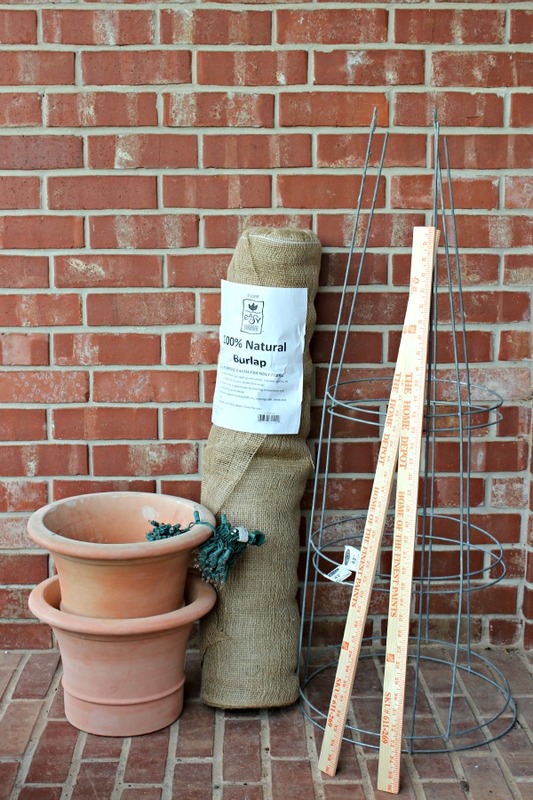 I like to begin by lining my pot with a large trash bag, then if I ever want to remove the concrete to use the pot for another purpose, it's easy to slip out. 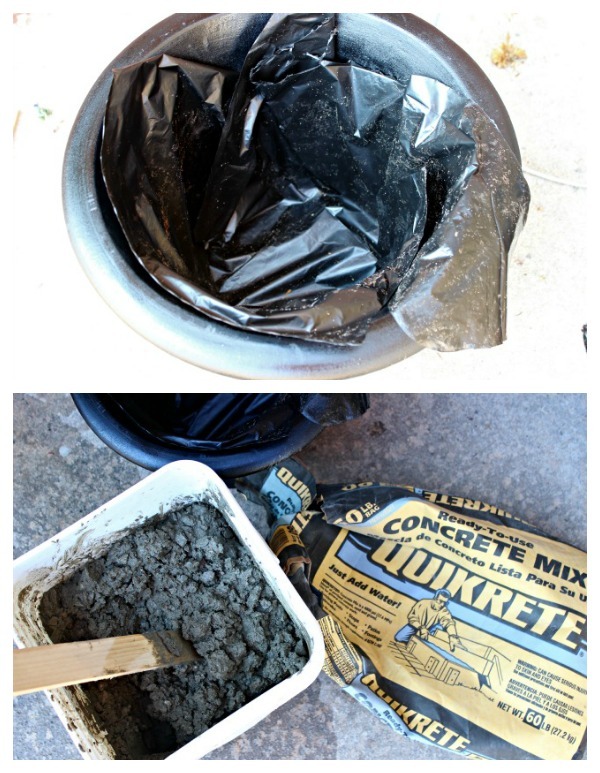 To create a sturdy base, mix a portion of the Quikcrete according to package directions. Fill the pot 1/2-3/4 full, deep enough that the yardsticks can be inserted several inches down in it. Push the yardsticks down into the Quikrete, making sure the holes you drilled are at the top. In hindsight, I should have used 3, placed where the corners of a triangle would go. Later on, three support sticks would have made it easier to secure the cage and make sure it sits straight and even. Skipping ahead a bit, the bottom right photo below shows how you will use a zip tie through the hole on the yard stick to secure the cage to the stick. While the concrete is drying, begin work on the tree portion. Squeeze the pointed ends of the cage together and weave a zip tie in and out several times before securing the three ends closed. 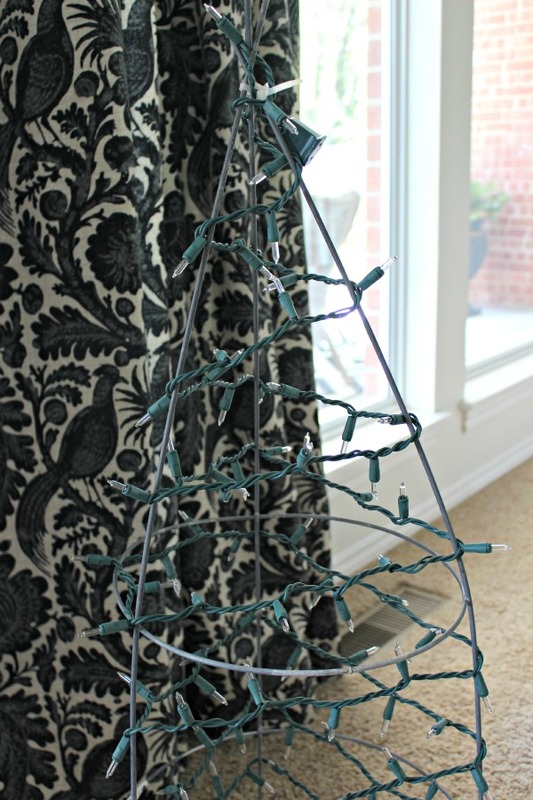 This is the top of your tree, make sure it's "centered" with the rest of the cage, and not leaning towards one side more than another. This is optional, but I wanted to be able to light the trees at night, so I started by wrapping the cage with a string of white lights. Be sure that the end with the plug prongs is at the bottom before you start. 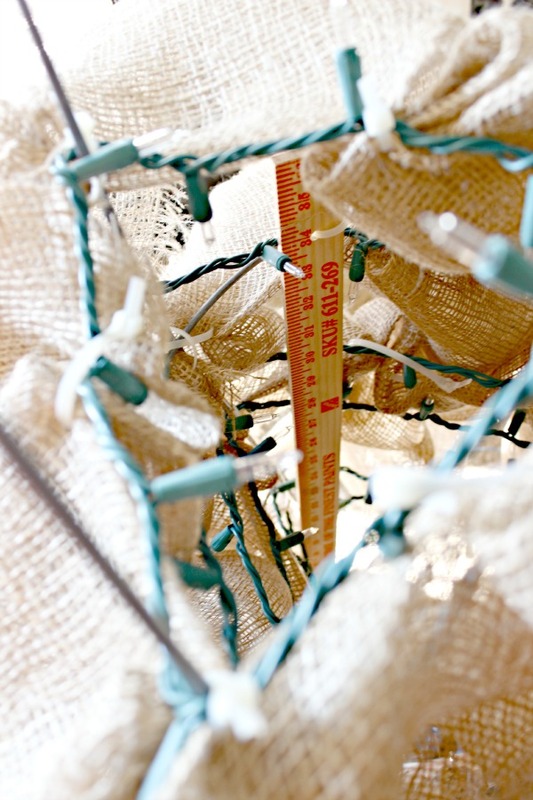 ;) Secure the top of the light string with a zip tie. 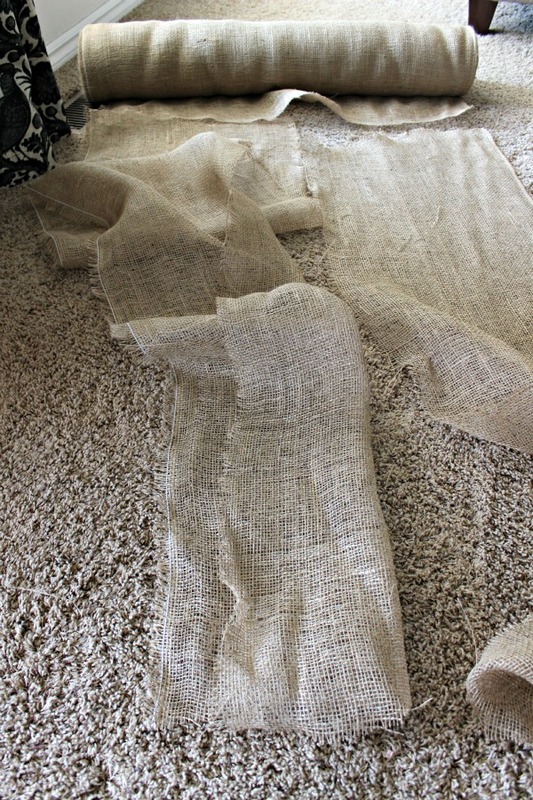 To prepare the burlap, I unrolled it into long strips and cut the width in half (so each strip is about 1 1/2' wide). My strips were probably about 8 feet long- I didn't really measure because you'll just cut more when you need it. Next, I folded each 1 1/2' wide strip in half to give it a little more bulk and thickness. If you want to leave a bit of overlap when you fold (so it's not folded exactly in half) it gives a little variation on the edge of the ruffles. Then, with the folded side of the strip up (cut sides down), I fed the end of a zip tie through the end of the strip and secured it to a cross piece on the bottom layer of the cage. 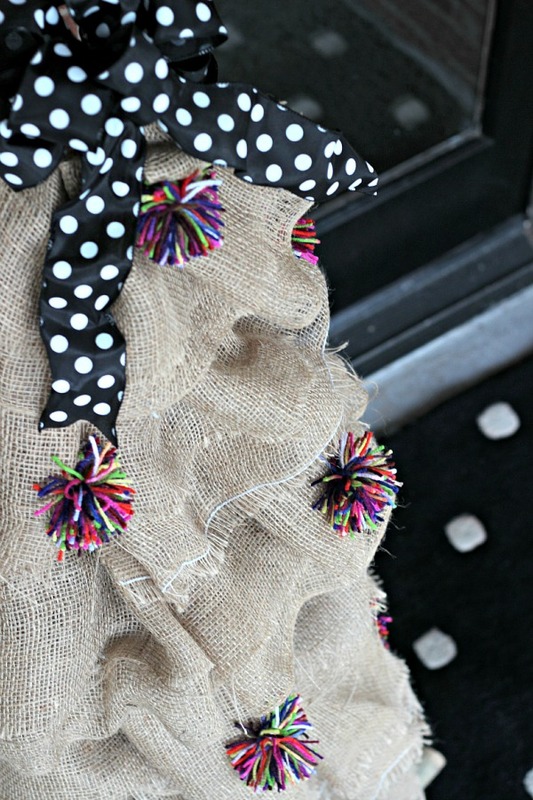 With a second zip tie, I threaded it through a portion of the burlap, skipping several inches and lacing it through, gathering the fabric up as I went. The first photo below shows about how much fabric I gathered, then pulled together and closed the zip tie. Then, repeat all the way around the bottom level. Next, move up to the next ring on the cage and repeat the process. When I got about half way up the cage, the metal rings around the cage weren't in the right place for another row of burlap, so I attached it to the light string and kept going around. 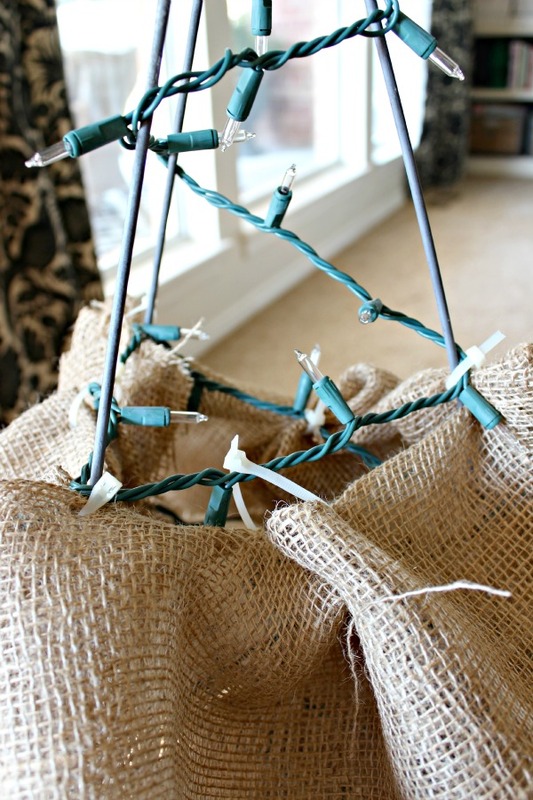 If you chose not to use lights, you might have to wrap some floral wire or something around the cage at this point to create something to secure the burlap to. 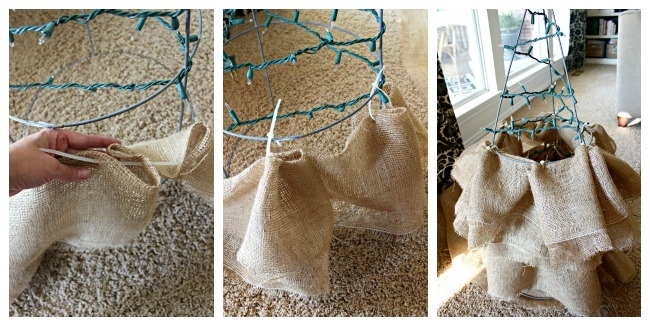 After the cage is attached to the base, continue with your burlap strips until the tree is finished! 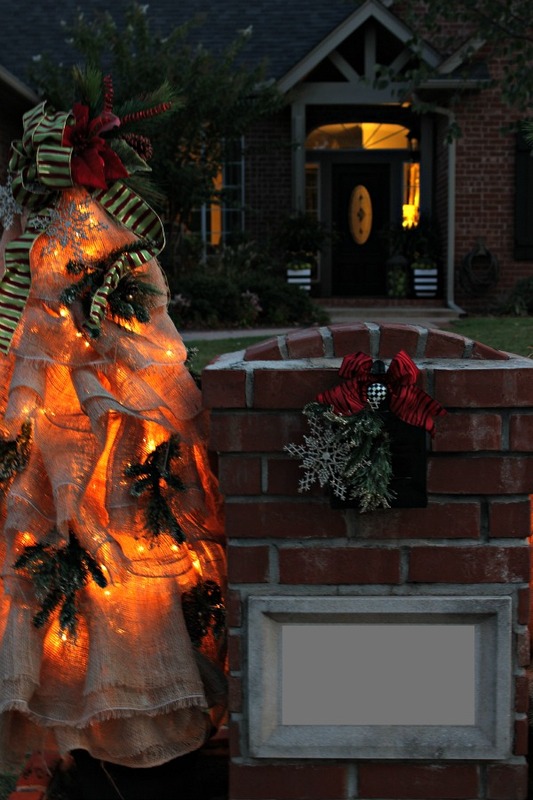 To finish it off, attach your choice of decorations to the tree. I used sprigs of greenery attached with more zip ties. Sometimes I attached it to the wire ring underneath, and sometimes I just threaded the zip tie through some burlap where I wanted the sprig to go. Finish off with a topper of your choice, and admire your work this holiday season! 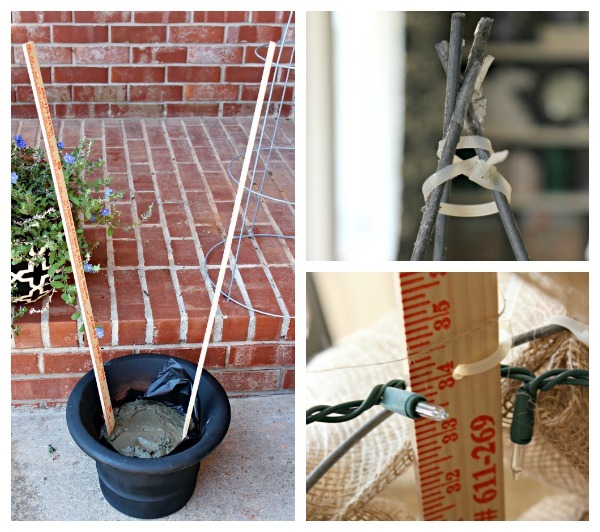 If you find tying big, full holiday bows challenging, a few years ago I made the one and only highly embarrassing video I've ever used on the blog that's a tutorial for how to make a bow. You can do it, I promise, just get a long piece of ribbon and practice with me. 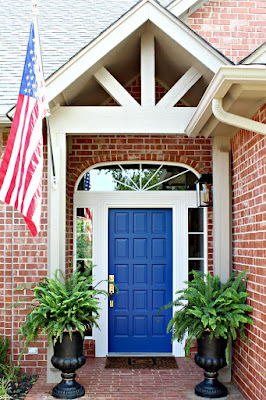 I actually think I'll use my trees on the patio, and I've been tweaking them a bit. I still have some work to do, but here's a little peek at where they're headed. Maybe you'll spot them in my Christmas Tour in a few weeks! 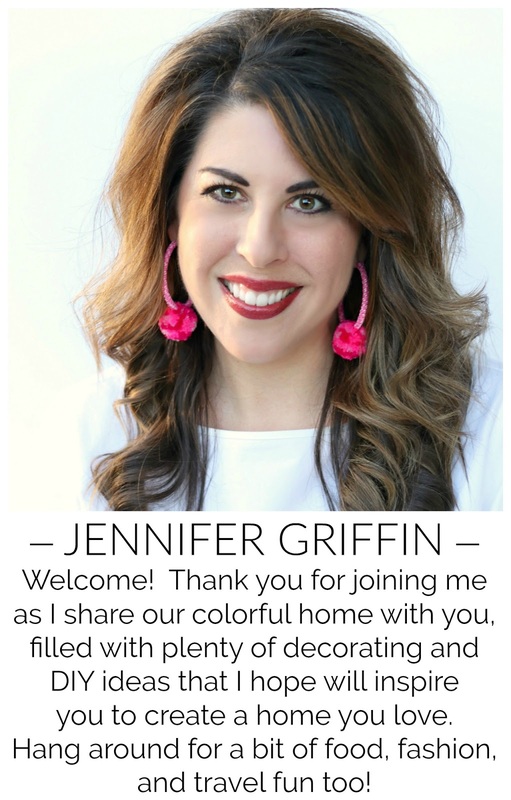 My husband and I are headed out this weekend for the Sailing with the Scotts Design Cruise with a few other of the best bloggers around...and the next few days will be a flurry of preparation until we head to the airport. I hope you'll follow along for all of the fun! And, if you happen to be going, be sure to find me at some point and say HI! I'll plan to have a few posts ready for you while I'm gone. If you think about it on Tuesday and Thursday, I sure would appreciate a little prayer as we present our blogger panels. I can sit behind the keyboard all day, but always get jittery when it comes to actually speaking in front of people! Thank you friends, Bon Voyage! !